You can sort a report by the contents of a single column by clicking on header of that column. You can also sort based on the data in one or more columns using the Sort button. 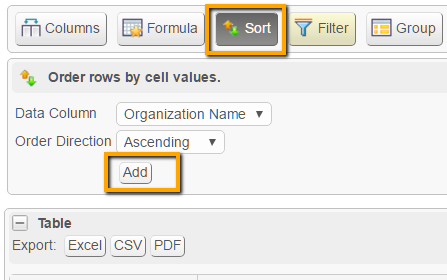 After clicking "Sort", select the column and order in which you want to sort and click "Add”. You can sort by multiple columns by adding additional columns to sort by. 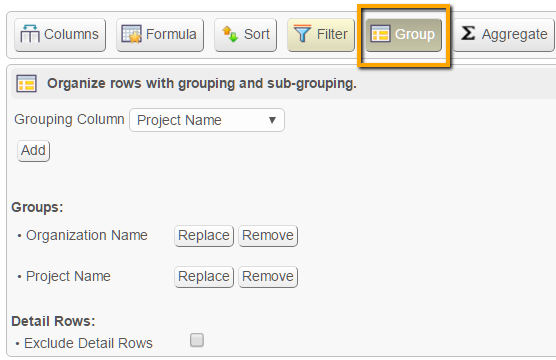 You can organize the data in your reports into groups by clicking the "Group" button and then selecting the column you want to group by. Like sorting, you can also group by more than one column.Note that when you group by a column with dates you can choose to group by day, month, quarter or year. Tip: If you want to see all of the responses that were given to a particular question, you can group by that question and then click the "Exclude Detail Rows" button.